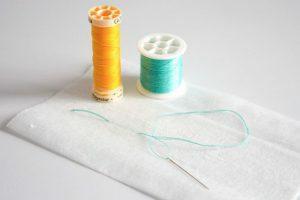 When it comes to sewing for beginners, where to start with your sewing kit can often get overlooked. Needles? Check. Threads? Check. Ready to go? Not just yet! 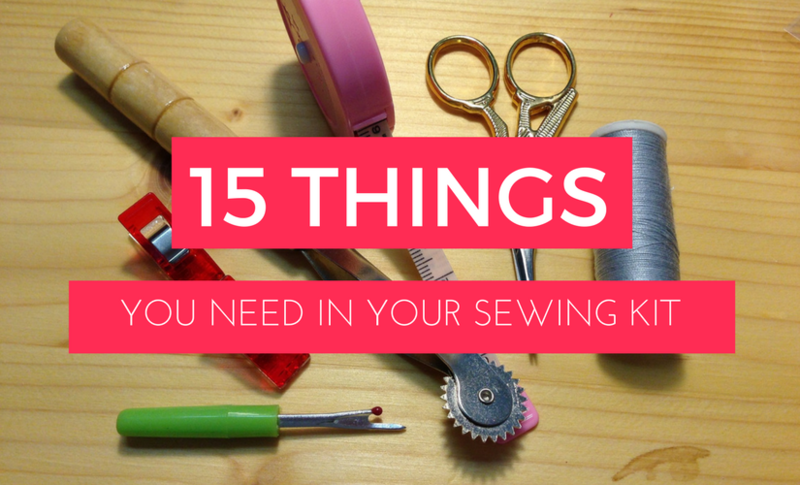 There’s a whole array of other useful things you should have in your beginner’s sewing kit from day one, allowing you to breeze through your first craft or fashion project. 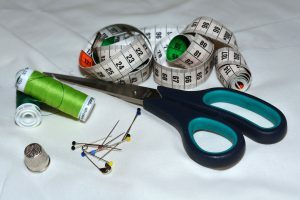 To help you get started, I’ve asked the lovely sewing community to share what they feel are absolute essentials for beginners. This was the number one answer I received, so this nifty tool is a must sewing for beginners essential. 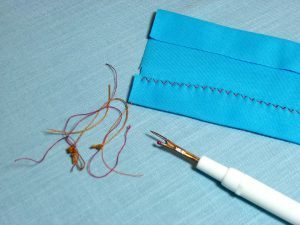 If you’ve made an error in your stitching, simply unpick them away and et voila! Start again and forget the whole thing ever happened. 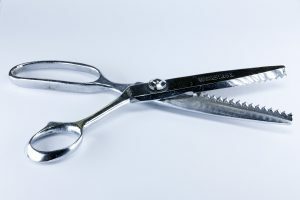 Watch your fingers, as fabric scissors (or shears) are very sharp, designed to cut through all sorts of fabric. You can get fabric scissors with unique blades, ideal for specialist sewing projects. There’s also fabric scissors that have the blades pointed down at an angle so they lie flat on the cutting surface when you use them. You’ll need a decent pair of embroidery scissors to cut your sewing thread or multi-ply embroidery thread. The distinct long pointy tips enable you to snip threads in very tight areas, and still get a clean cut without fray. Embroidery is a very precise form of sewing, so specialist scissors are necessary when there’s tricky to reach ends to clean up. Pinking shears have saw-toothed blades instead of straight, allowing you to cut a stylish zig-zagged line, but they also have another more practical purpose. If you’re using cloth with unfinished edges, cutting the fabric will result in a lot of fraying. 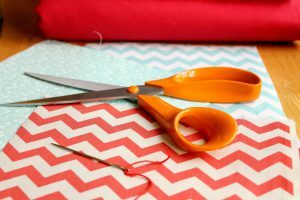 Whilst pinking shears can’t prevent fabric from fraying, the zig-zag pattern limits the length of the frayed thread, resulting in a cleaner finish. 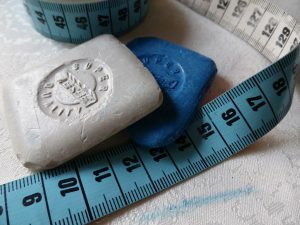 A tape measure is a must for all sewers, not just sewing for beginners. 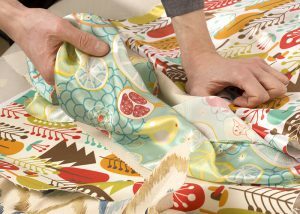 Measuring your fabric is one of the most important things you can do to ensure the success of your project. Asa the old adage goes, “measure twice and cut once”. The last thing you want is to produce a beautifully handmade garment, only for it to be too small or too big. A rotary cutter allows you to cut curves more accurately, thanks to the rotating circular blade. You can cut through several layers of fabric at once with your rotary cutters, allowing you to efficiently cut out pieces of the same shape and size. They range from small to large, and can serve different purposes. 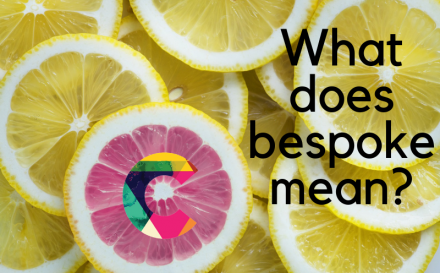 For instance, small rotary cutters are perfectly suited to cutting out small, intricate curves, whilst large ones are ideal for quickly cutting straight lines or larger, more broad curves. 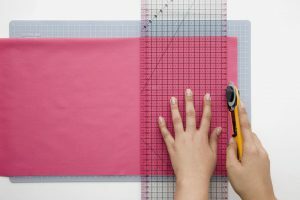 If you’re looking to embark on a little quilting, a quilters ruler is an essential item for your sewing beginners kit. Unlike any other ruler you’ve ever seen, this is the sewing industry’s version of a scientific calculator. Featuring grids, numbers and different angles printed onto the face of the ruler, it may be a little daunting, but it’s all there to guide you and ensure each piece of fabric fits together properly. You can of course get an ordinary pin cushion, but a tip I received from the sewing community was that a magnetic pin holder is much more effective. Rather than spending time fishing around for lost pins on the floor – or annoyingly finding them at a later date! 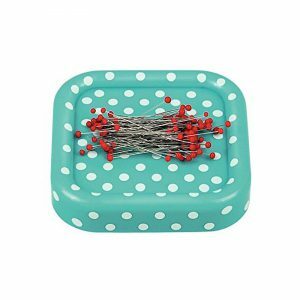 – use a magnet to collect them all in one, easy flourish. 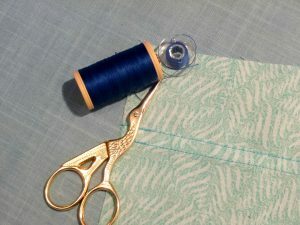 You are inevitably going to need to mark your fabric, indicating where to cut or mapping out your sewing lines. Obviously, you cannot use a regular pen, so it’s a good idea to investment in some chalk, or some washable marker pens that won’t ruin your fabric. When you’re working with sharp objects, it’s shouldn’t come as a surprise to hear you might one day prick your finger. It’s no big deal, but if you start bleeding all over your gorgeous fabric, then you’ve got a problem. 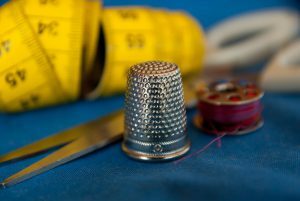 Use a thimble when hand sewing, and keep a pack of plasters in your beginners sewing kit – just in case! 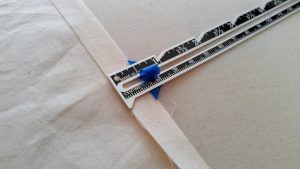 Used to mark and measure widths, it’s an essential sewing tool for beginners. It’s straight, sturdy and normally comes with an adjustable notch, so can be more reliable than ordinary measuring tape. A primary use is to measure hem widths, button hole widths and more. The main feature that sets this apart from an ordinary ruler is the centre slider, allowing you to accurately mark your point. 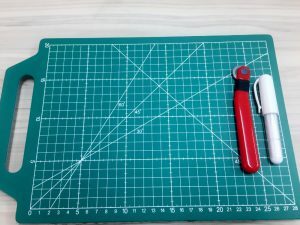 If you don’t want to ruin your table, I suggest investing in a self-healing cutting mat. They protect your surfaces from damage, yes, but they also have markings, angles and measurements to help you accurately cut your fabric. 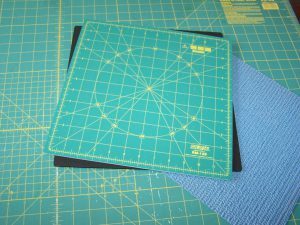 You can get a basic one, ideal for sewing for beginners, however it might be worth finding a good one that lasts longer, so you’re not throwing away mats every couple of years. This might just be your new favourite thing ever. 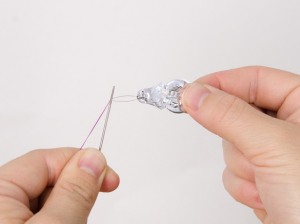 Gone are the days of licking the tip of a thread, squeezing one eye closed whilst you gingerly try to feed the thread through the eye of the needle. This little beauty does it all for you. 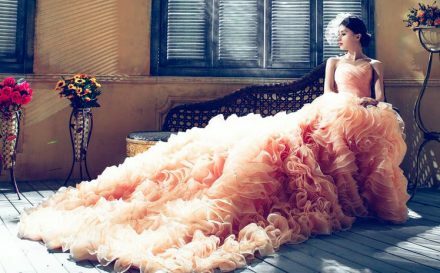 All of this would be redundant if you didn’t have loads of gorgeous fabrics to transform into beautiful creations! For an extra special touch, you can personalise your own fabrics here, permanently printed with your own unique designs. 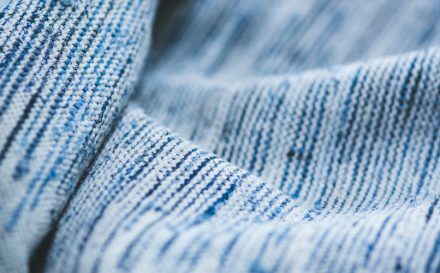 From natural cottons and silks to velvets and jerseys, our range of 100+ fabrics give you complete creative freedom. 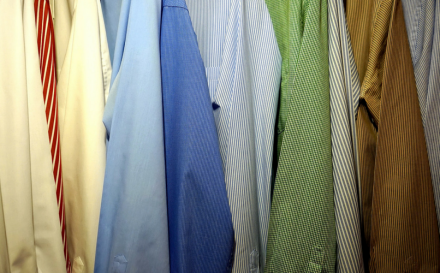 You want to know what kinds of fabrics there are and how they feel? Explore over 100 fabrics in your own swatch pack.